I started to make the Halloween theme bento with this quick and simple one. 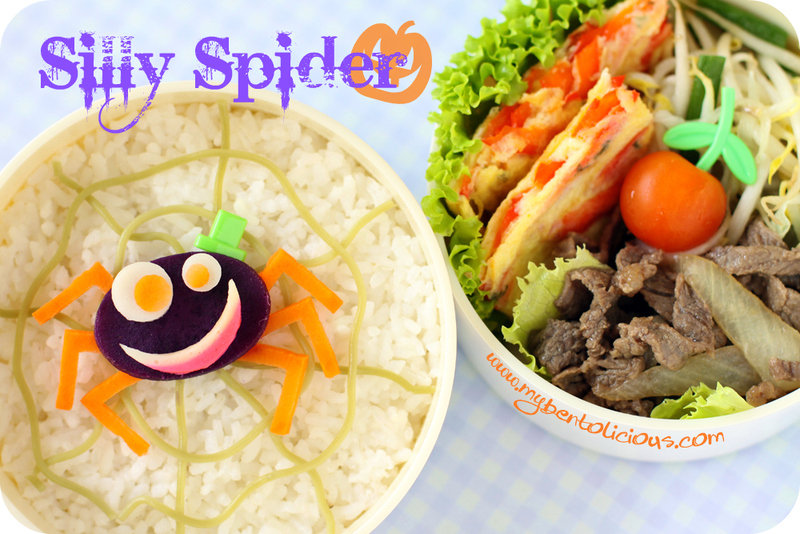 And I decided to make the silly 'spooky wannabe' spider with the web for my girl's bento. She knew that I put this spider inside her bento box this morning. I actually did show it to her purposely. So when she open the box at the lunch time, there will be no incident because of that silly spider. Don't want to end up her dropping or throwing the lunch box hehehe :D Silly spider was made of purple potato, kamaboko, and carrot. The web was made of cha somen. The spider and the web only took 15 minutes to fix, pretty quick and don't need so much bento tools, only oval and round cutters. I cut the spider's legs with small kitchen knife. Inside the box (as requested by my daughter last night) : thinly slices beef stir fried, bean sprouts and green onion stir fried, cherry tomato, and red paprika omelet. Brilliant idea of using somen as the web, as i always think cutting nori into a web is mission impossible for me..haha. Ooohhh .. spookyyyyy!!!! .. it's so nice to see so many halloween bento, I can get many ideas and learn more. This is a great spider! I love it! The web looks perfect :) Can I have one for lunch?? Oh Lia, it is so good to see your bento! It cheered me up and made me smile . This is so fun! A great cute looking spider AND yummy food to mix all together. So fantastic Lia! hahaa...silly spider! Looks a little silly with a cute name! LOL, he is a silly spider! So, so cute and love how you used noodle to make the wed..so smart! Spiderwebs are popping up all over lately. Your sweet potato spider looks so cute :-) What is kamaboko?